A TV channel funded by a Saudi prince was shut down by Bahraini authorities a day after its launch. The broadcast stopped after the channel gave airtime to an aid to an opposition leader, who is currently under arrest for criticizing the government. The Alarab channel was opened on Sunday. On its first day of broadcast it interviewed Khalil Al Marzouq, a former MP and member of Bahrain’s opposition Al Wefaq Shiite party. On Monday morning at 3am the channel stopped broadcasting news and has been instead showing promotional material. "The channel stopped broadcasting for technical and administrative reasons. We will come back soon, God willing," the channel tweeted later on Monday. Bahraini authorities too stated that the order to stop broadcasting issued by its media regulator, the Information Affairs Authority, had nothing to do with the interview. But the website of Akhbar al-Khaleej, a privately-owned newspaper, said the suspension was "related to the failure of those in charge to abide by the prevailing norms in the Gulf, including the neutrality of media positions and staying away from anything that could negatively impact the spirit of Gulf unity." Alarab’s decision to invite Marzouq was also blasted by the daily Akbar Alkhaleej, which said the channel was violating “common norms in Gulf countries,” and questioned its editorial stance. Marzouq spoke on the air about the Saturday decision by the Bahraini authorities to revoke the nationality of 72 subjects of the kingdom on allegations ranging from endorsing terrorism to advocating regime change. Marzouq, who is an aide to Wefaq leader Sheikh Ali Salman, said the decision was politically-motivated and taken without a fair trial. The shutdown of the Al-Arab channel “is really affecting the credibility of the authorities in their saying that ‘we have an open space, we have freedom of expression’ if they cannot tolerate listening two minutes from a different view,” Marzouq told RT. The Wefaq party is not unfamiliar with the heavy-handed approach the Bahraini monarchy takes to protect itself. Salman was arrested in December on charges of promoting regime change in a move that was condemned by foreign human rights groups and many governments and sparked street protests in Bahrain. Alarab is trying to shoulder its way into a crowded Arab media market. It is funded by Saudi billionaire Prince Alwaleed bin Talal, who pledged to fund its operation for 10 years, and is targeting primarily the Saudi market, but was opened in Bahrain because, unlike Saudi Arabia, it allows independent news channels. 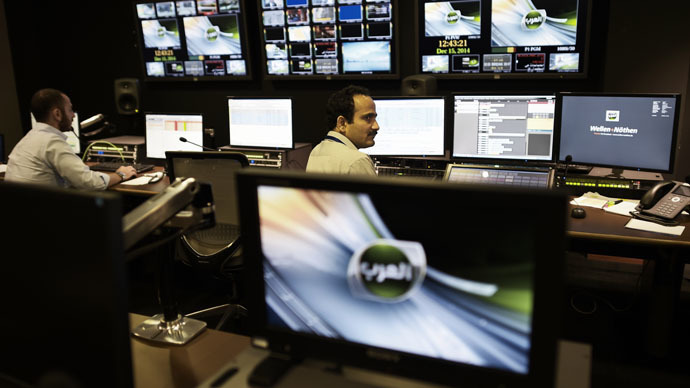 The station is facing heavyweight competition from Saudi Arabia’s Al Jazeera and Qatar’s Al Arabiya and plans to claim its share by providing a view balancing agendas of state-sponsored news. The channel says it has staff of more than 260 and bureaus in major Arab countries as well as reporters in New York, London and other big Western cities. Bahrain is a small island nation hosting the US Fifth Fleet. Its ruling Sunni Al Khalifa family has been facing pressure from the Shiite majority since the Arab Spring of 2011. The public uprising that engulfed Bahrain at the time was brutally suppressed with the help of Saudi Arabia, which sent its troops to back the Bahraini regime. The monarchy has routinely persecuted opposition figures despite all criticism. Last month prominent activist Nabeel Rajab was sentenced to six months in prison for a tweet considered insulting to the Gulf Kingdom’s Ministries of Interior and Defense.